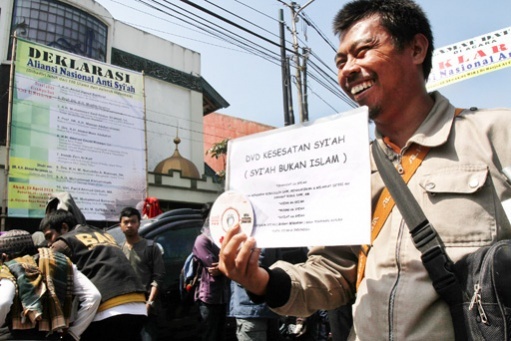 JNN 23 April 2014 Jakarta : More than 1,000 people attended an anti-Shia declaration on Sunday at the Al Fajr mosque in the West Java capital of Bandung, in what appeared to be the first organized attempt to persecute Shiites in Indonesia. Supported by a dozen high-profile clerics, the Anti-Shia National Alliance called on the public to fight what they said to be the proliferation of Shia influence, which they deemed a “heresy” in Sunni-majority Indonesia. The alliance, formed to spearhead Shia persecution nationwide, also called on the public not to support presidential hopeful and Jakarta Governor Joko “Jokowi” Widodo as his party, the Indonesian Democratic Party of Struggle (PDI-P), had promoted a top Shia figure to become a legislative candidate. The alliance’s chairman, Athian Ali, declared four points in the organization’s guidelines, which included approving the use of violence to prevent “heretical” teachings. “There’s growing public concern about the spread of the Shia [branch of Islam]. It’s our duty to protect society,” said Athian, who has a degree from Al Azhar University in Egypt. Aside from Athian, other luminaries attending the event included Abdul Hamid Baidlowi, a Nahdlatul Ulama (NU) cleric. His father helped found the NU, the country’s biggest Muslim organization, known for supporting tolerance and pluralism. NU cleric Ahmad Cholil Ridwan, a graduate of the Islamic University of Madinah in Saudi Arabia, is also one of the alliance’s staunch supporters. Cholil said the alliance would fight on the political front in response to the PDI-P’s decision to choose Shia figure Jalaluddin Rakhmat as its top legislative candidate for the West Java area in the April 9 legislative election. It remains unclear whether Jalaluddin has secured a legislative seat. “Don’t choose Golput [to abstain] in the coming presidential election. It will pave the way for Jokowi to become the president. If he’s elected, Jalaluddin will be his religious affairs minister. Do you all want that?” said Cholil before the crowd. A Shia-linked organization, the Indonesian Ahlul Bait Association (IJABI), has sent letters to the West Java Police, the West Java governor and the commander of the Siliwangi Regional Military Command to protest the alliance’s declaration. “We do not object to the activity but to the statement of hatred,” IJABI chairman Hesti Rahardja said. In the past five years, the persecution of Shiites has increased, with the Syrian conflict feared to be exacerbating the violence. The National Counterterrorism Agency (BNPT) has announced that at least 70 Indonesians have flown to Syria and joined rebel groups that are attempting to topple the goernment of Syrian President Bashar al-Assad. The BNPT has voiced its concern that if the Indonesian combatants return home, they will act against Shiites in Indonesia. Having the world’s largest Muslim population, Indonesia is estimated to be home to at least 3 million Shia followers, with West Java home to one of the highest concentrations of Shiites. 1. The alliance is a preaching forum to promote virtues and prevent abominable acts. 2. The alliance will take any necessary measures to maximize the prevention of the proliferation of heretical teachings by Shia followers. 3. The alliance will forge good relations with other preaching organizations. 4. The alliance will demand that the government immediately ban Shia and revoke all licenses for foundations, organizations and institutions owned by Shiites. West Java Governor Ahmad Heryawan said on Thursday that he would not accept an invitation to attend the declaration of the Anti-Shia National Alliance to be held at Al Fajr Mosque in Bandung on Sunday. “I must have an attitude to build harmony among West Java residents, thus [my stance] is not to attend,” Heryawan said on Thursday. However, Heryawan stopped short of denouncing the event. Shia followers in Bandung, West Java, have filed a protest with local authorities over a planned declaration by the Anti-Shia National Alliance, scheduled for Sunday, fearing that the event could incite hatred against Shiites , and the first step towards Promoting Sectarianism in the country . “We cannot hate something that is not [physically] there,” chairman of the Indonesian Ahlul Bait Association (IJABI), Hesti Rahardja, said Saturday. He expressed his fear that Sunday’s declaration would not so much create hatred against the Shia community as a whole, but more against individual Shia followers. “We respect freedom of speech, but the statement has the potential to incite hatred,” he said, reiterating the importance of maintaining calm ahead of July’s presidential election. Hesti confirmed that IJABI had sent letters to the West Java Police, West Java governor and the commander of the Siliwangi Regional Military Command (Kodam) III to protest the planned Anti-Shia National Alliance declaration. “We do not object to the activity but to the statement of hatred,” Hesti said. West Java Police spokesman Sr. Comr. Martinus Sitompul did not comment much on the issue. “An activity that is held at a house of worship does not require a permit from the police,” he said on Saturday. Previously, West Java Police chief Insp. Gen. M. Iriawan said on Friday that the police had not received any information about the event. “There is no permit [for the event]. If they do not hold a permit, we will take the necessary action,” he said. Human rights campaigners have also condemned the scheduled declaration. “Our stance is firm: We condemn the movement because it’s a form of sectarianism that could [fuel] conflict,” said Ahmad Fuad Fanani of the Maarif Institute for Culture and Humanity. Deputy chair of the Setara Institute for Peace and Democracy, Bonar Tigor Naipospos, also rejected the move, calling it “hate speech” toward a minority group, adding that hate speech was a crime according to the Criminal Code (KUHP). Anti-Shia National Alliance head Athian Ali said the declaration was part of an agreement made during a National Ulema Meeting and the Indonesian Islamic Ummah in Bandung on April 22, 2012. The organizing committee plans to make the declaration at Bandung’s Al-Fajr Mosque during the event, which is scheduled to run from 8:30 a.m. through 12 p.m. Banners and posters for the event have been set up across the city in the past week. Athian added that more than 100 clerics were expected to join in the event. The posters also refer to a number of Indonesian Ulema Council (MUI) figures due to speak on Sunday, including Abdul Muis Abdullah, chairman of the MUI Balikpapan chapter, and Muhammad Baharun, a member of the council’s central executive board. As of Saturday, Rafani said the West Java MUI had not been officially notified or invited to the declaration event, adding that, therefore, it was unnecessary to send a representative. So far, MUI has not stated its position over the declaration. Asked whether the event had the potential to spread hatred, Rafani said all responsibility lay with the organizing committee. He called on people to be wise in responding to the event. “There is no need to become emotional. I hope no disturbances will occur,” he added. West Java Governor Ahmad Heryawan also declined to say where he stood regarding the declaration, although he has confirmed that he will not be attending the event. 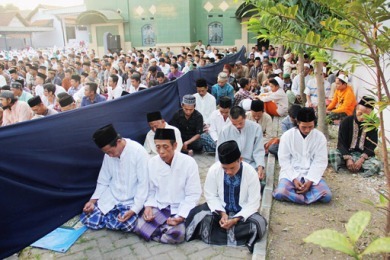 In Indonesia, Shia is a minority Muslim sect within the country’s Muslim-majority population, which is dominated by Sunni Muslims, while the recent events Point out that Wahabi forces are trying to Infest in the Sunni Sect . Religious Affairs Minister Suryadharma Ali previously called Shia Islam heretical, saying that it deviated from principal Islamic teachings. Persecution of Shia followers has escalated in the past few years. In 2012, Tajul Muluk, a Shia leader from Sampang, East Java, was sentenced to two years’ imprisonment for blasphemy. In the same year, a mob set fire to dozens of Shiite homes in Sampang, killing two Shia followers and forcing hundreds of others to take refuge in Sidoarjo, around 100 kilometers away. This entry was posted in Asia Pacific and tagged Anti Shia Alliance, Anti-Shia National Alliance, Indonesia, Sectarianism, Wahabi, West Java Governor Ahmad Heryawan. Bookmark the permalink. TREAT THEM AS A TSUNAMI Boycott them completely is the only way . Let the waHABI SALAFI FEEL SHAME , DON’T WISH THEM , DON’T REPLY TO THEIR WISHES, NO HAND SHAKE , NO HUGGING, COMPLETELY NO CONNECT AS IF THEY ARE DIRTY BEASTS AND DON’T DO ANY THING WHICH ANY WAY HELP THEM . SOON THEY WILL COME TO TERMS OR DISINTEGRATE .